I picked this up after watching the Netflix movie of the same name. I loved the movie (you should deffo watch it) and decided I needed more. There are a number of differences between the movie and the book, as is to be expected, and I might do a comparison post soon. This is a really good science fiction novel. This was the first I had read anything from this author. 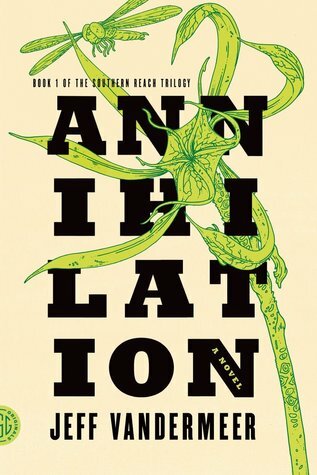 VanderMeer is somewhat of an established modern day powerhouse in the SciFi world and it is easy to see why. The balance between fact giving, plot driving narrative mixed with descriptive, thought provoking scenes kept me interested throughout. I really like how this challenges the normal alien invades to take over everything by destroying all other life forms! Oh my god run for your lives! cliche. This is a much more scarier alien in my ever so humble opinion. This alien won’t shoot you with a laser and vaporise you. It ain’t after earth’s gold or water or diamonds. It hasn’t come here with a fleet of interdimensional spacecrafts. It simply wants to live. It just so happens that it landed on earth. The way it lives is to evolve by copying aspects of other life and developing with it’s new knowledge. It also changes the environment around it, hence, we have the Shimmer. No, not the Women’s Professional Wrestling promotion, but you should check them out too because they are wonderful. More of a changed environmental biome. Problem is, if you are in the Shimmer, it will change you too, for the shits and giggles. And the Shimmer is growing in size, rapidly. Imagine some ominous music played here because that would help with the dramatic effect I was going for. K thnx luv u. The protag is wonderful. She is super savvy and full of courage but in a very realistic way. She has a couple of flaws, which I always like in a protag. I found the supporting characters to be less interesting if I’m honest, and at times I lost track of who was who. I think one of the risks of having a band of folk on a quest is that the supporting characters can meld together if not defined enough. I felt this fell into that trap. But it didn’t take away too much. Also, I was not too keen on the hypnotism and how that works. It just felt a little too unbelievable at times. Overall, I enjoyed reading this. I’m glad I picked it up. I will probably read book 2 and 3 of the series if I get chance (it might be an audiobook situation) because I am interested to see where the story goes. There are a number of unanswered questions I would like answering. This is a solid Sci Fi novel that stays true to what we love about the genre, whilst giving us something a little new and refreshing. Anyway, I’m off to build a tower under the ground because that makes perfect sense. Until next time, Peace and Love! Great review! I’m not a Sci-Fi reader but this sounds interesting. I did not realize the film was on Netflix already! I will have to add it to my queue. I am really stoked that this delivered for you. I read his book Borne and loved it! I was instantly hooked on his writing and world building. It sounds like he really delivers with this one. Stellar review!